When my oldest daughter was 2-and-a-half, she made it abundantly clear (as toddlers do) that she wasn’t going to play quietly at my feet while I worked at home. Pressing work and active toddlers don’t mix, so I quickly started looking for twice-weekly child care. Along with healthy snacks, nurturing staff and loads of natural light, I looked for providers who prioritized outdoor play, with bonus points given for physical spaces with direct access to the outdoors. My reasoning was simple: I wasn’t going to pay someone else to coax my energetic child to sit inside. I could do that myself (er, I could try). If I was going to schlep her to a child-care provider twice a week, I wanted her to run, jump, climb, explore — all things I couldn’t supervise during my working hours. In the end, I chose a well-established in-home center with a glass-walled main room that opened directly into a fenced play area complete with a vegetable garden, a honeybee colony (during our tenure, no stings), and paved paths for bikes and trikes. Kids played under a covered porch during downpours and in the sunshine the rest of the time. She came home dirty, happy and tired. Mission accomplished. She’s since moved on to school, with fond memories of day-care hours spent examining bugs, making mud pies, and just generally being a kid outside. So I was a bit shocked to see the recent study published in Pediatrics showing that children in child-care centers get only 48 minutes of opportunities for active play each day. That’s far less than the 120 minutes of daily active play recommend by The National Association for Sport and Physical Education and Let’s Move! Child Care. Even more surprising: the study was based at Seattle Children’s Research Institute in the woodsy Pacific Northwest, where the “outdoor preschool” trend is firmly entrenched. Schools like Cedarsong Nature School on Vashon Island, Fiddleheads Forest School in Seattle, and Tiny Treks in Redmond operate outdoors yearround, rain or shine. The mild yearround PNW climate — damp, but rarely frigid or scorching — is well-suited to this type of setup, and multiple studies link outdoor play to enhanced learning and emotional and behavioral regulation in children. Researchers from the Center for Child Health, Behavior and Development at Seattle Children’s Research Institute studied 100 children aged 3–5 in 10 day-care centers over two years. They found that kids in day cares were sedentary 73 percent of their day, and weren’t being offered opportunities to be more active. (Read: no sliding glass door with free access to a backyard playspace, like my daughter had.) Of the 48 minutes of active play daily, only 33 minutes were outside. And kids spent fewer than 10 minutes per day in teacher-led active play. Dr. Pooja Tandon, the study’s lead investigator, called the lack of opportunity for active play the most troubling aspect of the study. When given the choice, kids will usually choose active play, she reasons. Without adequate chances to burn off energy with active play, behavior deteriorates (I concur, based on evidence collected in my own household) and learning is stifled. What’s the solution? Not everyone can be as choosy as I was — lots of factors complicate the choice of a day-care center, including access and availability in the increasingly tight market for quality, affordable child-care. 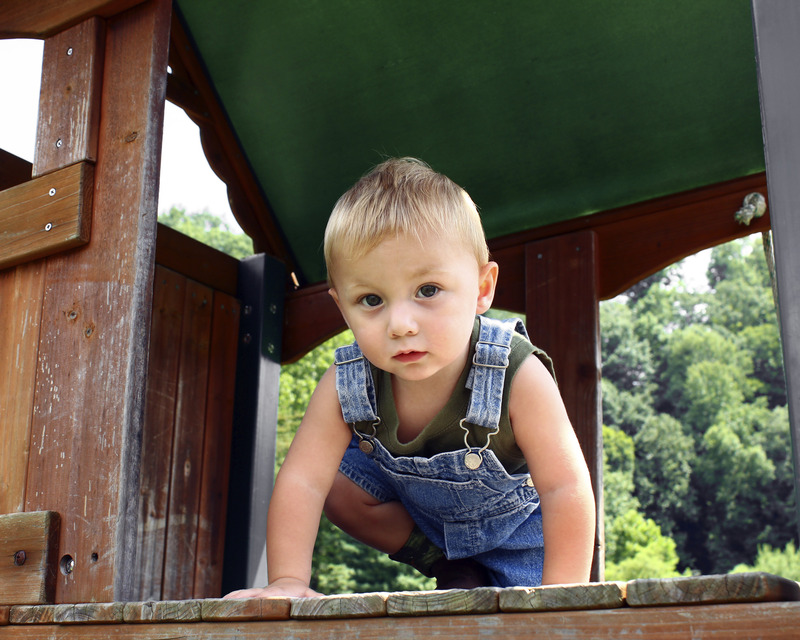 Tandon advises parents to advocate strongly for active play at their child’s day-care center, and send their child to day care appropriate dressed and equipped for outdoor play (in weather appropriate play clothes, with shoes suited to muddy play and an extra set of clean clothing in a backpack). And don’t freak when your child comes home with a faceful of mud or dirt under his fingernails. It just means you chose well.